When refurbishing a Kitchen, the cost of the refurbishing is calculated by separating the Labour Cost and Material Cost. Labours – to demolish the old kitchen, remove old tiles, tide up the building site, and do unqualified works. This type of work can be done as DIY job. Electricians – the electrician must be NICEIC Qualified Electrician. The electrician will install new plug points, power points, lights, connect the electrical appliances. Plumbers – if you have a Gas Hob, or Gas Oven, the a Gas Safe Registered Plumber will be needed. The plumber will make sure that the Gas pipes and appliances are installed, fitted and connected correctly and safely.Any plumbing that will go into the walls, must be done before the plastering. The plumber will fit and install the kitchen sink, run the plumbing pipes, hot and cold water supply, waste pipes. Plasterers – if the walls needs to be re-plastered or skimmed.Uneven walls or damaged plaster,must be repaired before the kitchen installation can proceed. Wet and humid walls can damage the kitchen units, the plastering should be done well in advanced and after the electricians has installed the sockets and other power points. Carpenters – the carpenter will install and fit the Kitchen cabinets and units.If the worktop is made of wood, the carpenter will cut out the worktop for the kitchen sink, cooking hob and fit the worktop too. Tilers – the tiler will have the job of laying floor tiles and wall tiles. A good tiling finish is paramount for any kitchen refurbishment. Painters and Decorators – the painters and decorators will ensure a good finish paint job.Because the kitchen is exposed to constant vapours and humidity, sometimes an acrylic based paint is recommended, and these types of paint are notoriously difficult to work with. There are numerous shops and kitchen suppliers from where you can buy a kitchen. The prices and quality can range from very cheap to very expensive, and from good quality kitchen to terrible. For example, a medium sized kitchen can cost from £1900.00 to well over £27000.00, for the same number of kitchen units, appliances and size. Kitchen Cabinet Units – the quality cabinets are made of solid stain grade wood,cherry, maple, oak, etc. A much cheaper version of cabinets material is made of melamine foil covered boards. MDF cabinets can be made by carpenters for custom made kitchens. Kitchen Doors – the kitchen doors are the kitchen,the most important element in the appearance of your kitchen. The quality of finish on the doors should be very durable, scratch resistant, easy to clean. And of course, very aesthetically pleasant. Worktops and Countertops – worktops are exposed to heavy traffic,spills, hot pans and sharp knives. Granite is a good choice when durability and elegance is important. Other types of worktops are made of; Wood, Acrylic,Stone,Laminate and Glass. Custom made worktops are more expensive than standard worktops, which can be cut and fitted by the carpenter. Kitchen appliances – cooker hobs, extractor hoods, ovens, dish washers,fridges, kitchen sinks, etc. The cost for kitchen appliances, can be major, as much as the kitchen cabinets, doors and worktops, and sometimes even more. Robuild London Kitchen Fitters and Installers, can offer a Full Kitchen Refurbishment Service, from Kitchen Design to installation and fitting. If the existing hot and cold supply is in copper, your problems are simple. Compression joints (with nuts) can be disconnected and new lengths of pipe run to the new taps using compression joints. If the joints are capillary (soldered), heating with a blowlamp will enable them to be pulled apart and new joints made. If the supplies are in steel pipes you’ll have to locate a threaded joint in the steel pipe-there’s one where the old taps join on but there may be others more convenient for your new pipe run farther back. Unscrew steel joints you may need to heat them first – and fit a steel-to-copper adaptor using PTFE tape for the steel side, then run new piping in copper. If the supply is in lead you will need a plumber to make a lead to copper joint from which you can pick up in copper, or to connect the lead pipes to your new taps; joining lead is a skilled job. Pipes coming down to taps over the sink will have to be extended below the kitchen sinks or bathroom basins and there turned up to meet the threaded ends of the new taps. the new taps; pipes from below are easiest of all because they will only need cutting short to connect to the taps. Pipes on the surface of the wall are easiest to deal with but present problems if they pass from above, behind the back of the sink or basin unit to reach the taps. Turn pipes to run parallel with the sink top, dropping down a the end of the unit to enter through end panel; or hack channel in the wall. Ideally this channel should have removable cover, but most houses survive without such refinement. Drill sink base for fitting to wall, stand it in place and mark wall for drilling and plugging. Now fix the waste pipe; unless the old one if sound and in precisely the right position it’s quicker to scrap and fit a new waste pipe in plastic. Cut holes for waste and supply ‘ pipes in unit where necessary. With sink or basin unit away from wall fit swivel coupling; loosely to taps; complete running supply pipes to sink position. Now tighten swivel couplings to taps using fibre washers or jointing paste and hemp for a watertight joint. Put complete unit in place, screw it to wall and connect hot and cold supplies. Turn on water and check for leaks. When you are sure everything is sound, make good and plaster and tiles. but not beyond the skill of a DIY amateur householder. below the sink) or by a stop tap outside, usually in or near the path. Hot water should be controlled by a valve in the pipe from the cold tank in the roof to the hot cylinder. If your house or flat hasn’t such a valve (many haven’t) having turned off the cold stop tap simply turn on all hot taps until no more hot water comes out. damage because while the 25 or 50-gallon cold tank will empty, the hot water cylinder itself remains full. (If you can’t bear the thought of wasting all that hot water, turn off heating the night before.) If hot water is supplied by a separate gas or electric heater, turn off the valves on the heater itself. centre of the waste fitting, or by a large nut beneath the sink tightened on to the threaded stem of the waste fitting. You may have to tap the waste fitting to break the seal of old hard putty which will hold it to the sink. Then slide the sink forward off its supports (take care: it’s heavier than you think). If you are replacing it with a similar fireclay sink, simply clean off beneath the tiles where the old sink fitted and slide the new one into place. a modern sink in its place, there’s rather more to do. If pipes to taps over sink are sunk in wall, hack off tiles to reach them. (Keep a piece as a sample if you want to match them.) Dismantle any cupboards under sink; take away any wooden sink supports. care to avoid damaging the trap; lead fittings are not very strong. In changing an old-fashioned sink for a modern one you’ll have to remove some tiles to get at pipes behind taps above sink. To avoid breaking more tiles than necessary, cut the grout between them with razor blade. Wooden sink supports are easily removed : saw through tubular supports, cut out or break cast-iron ones. unit and stand that against the wall, marking where sink top, bottom of tap stems and waste will come. Move it out again and cut a groove in the wall so back edge of sink fits snug behind line of tiles. a thick, shaped nylon spacer washer with the flat side against the underside of the sink. On to that goes the backnut, with its flat side against the washer. If you are installing a mixer valve instead of individual taps, there will be the same thick washers underneath, but one large sealing gasket on top of the sink instead of the thin nylon washer for each tap. Tighten the backnuts.There are different kinds of waste fittings. Fit the nylon or rubber washer supplied,inside the sink beneath the chrome outlet and another outside (beneath) the sink above the nut which tightens the fitting. Our Kitchen fitters and Installers offer Kitchen Fitting and Installation Services, plus Design if necessary. A complete one stop kitchen installation, design and fitting service, sometimes we can provide the kitchen units as well, based on your personal taste and budget. The bathroom installers and fitters can design and plan your bathroom and shower using CAD based designing programs. Plumbing,plastering,electrical work, underfloor heating (heating under the tiles) tiling and carpentry are included in the services provided by the London Bathroom fitters & Installers. 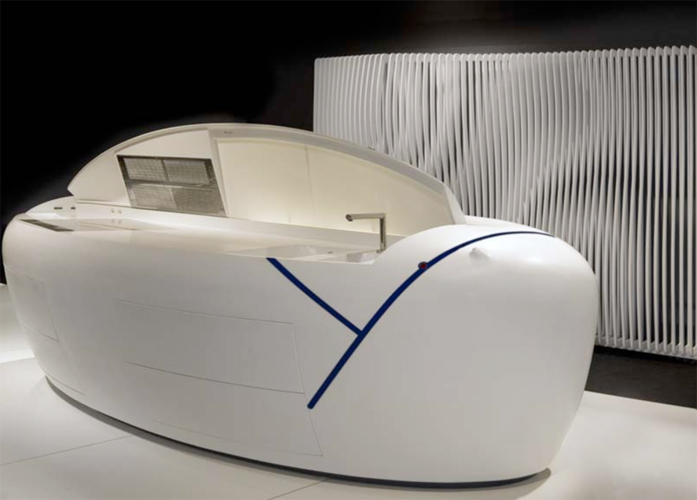 Inspired by a dream about a cloud, he developed his The Sky Is The Limit kitchen island pod together with the firm HI-MACS.